So elegant! Serving well as a multi-purpose kitchen helper! ▶ The 8 ounce ramekin set, diameter 4 inch, height 2.1 inch. Just the right size for creme brulee, individual cobblers, cupcakes, or any number of other recipes. And SIX set is a great when you want to use them for ingredient prep. ▶ Striated edges allow you to put these creme brulee dishes into the oven with more comfortable grip, worry free about slipping. And the striated edge makes these souffle dishes look more fashionable and help you to better match your dessert. ▶ Dishwasher safe and easy to clean by hand if needed. They are safe for freezer, microwave, and oven as well. They are packaged in a well wrapped box, a perfect gift for your friends and family on Housewarming, Wedding party, Mothers' Day, Fathers' Day, Christmas and New Year's Day. VERSATILE! PERFECT SINGLE SERVING SIZE - Sweese ramekins are versatile dishes for souffle, creme brulee, jams, dipping sauces, french onion soup, blueberry crumble, drawn butter, olives, quiche and ice cream. And It is the right one and let everyone enjoy delicious food without worrying over-eat! EASY CLEANING - These soufflé dishes have a glazed coating so it is quite smooth, so easy to clean! You can wash them with soap and hot water or place them into your dishwasher. BRIGHT WHITE COLORING - Sweese porcelain ramekin dishes have industry-favorite traditional contours, ideal for various dining environments, from casual to the white tablecloth. Sleek ramekins are sure to create a dining experience your guests won't soon forget. 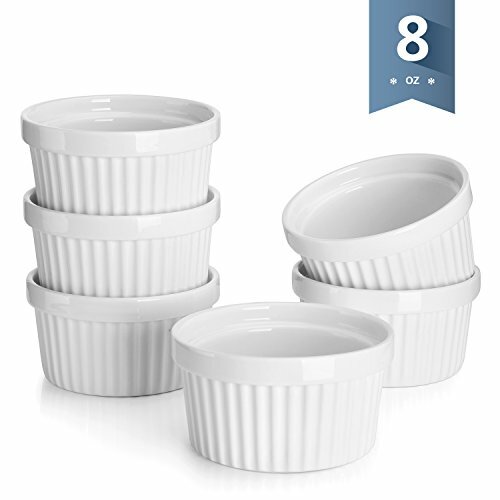 PRO-GRADE PORCELAIN & SAFE FOR DISHWASHER, MICROWAVE, OVEN AND FREEZER - These Sweese ramekins are PROUDLY FDA approved and made of durable porcelain, a type of premium LEAD-FREE and NON-TOXIC ceramic, chip-resistant and more sturdy than stoneware. Creation of Sweese ensures you get what you pay for, BEWARE OF CHEAP KNOCK OFFS! 30 DAY NO-CHIP WARRANTY - Your purchase is backed by our exclusive 32-day No-Chip warranty - Sweese will offer a free replacement or refund if anything goes wrong with the product. That's ZERO risks! Scroll down for more info.